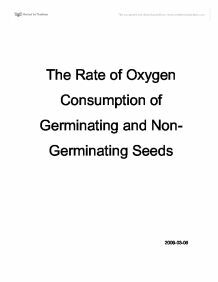 The Rate of Oxygen Consumption of Germinating and Non-Germinating Seeds 2009-03-06 Oxygen consumption in Germinating and Non-germinating Pea Seeds Purpose: To find out and compare the cellular respiration rate at different temperature by using germinating and non-germinating pea seeds. Hypothesis: If the germinating peas are in the cold or the room temperature water, then the rate of cellular respiration will be higher than the rate for the beads or the non-germinating peas. The colder the temperature of the water is, the slower the process of cellular respiration in the peas is. Variables: Controlled: Peas Independent: Temperature, time Dependent: Rate of oxygen consumption Materials: * * Thermometer * Pencil and paper * A water bath * Beads * Germinating Peas * Non-germinating Peas * Beads * Beaker * Ice * Food colouring * Paper towels * Potassium hydroxide, KOH pellets * one-hole test-tube stoppers * Tape * Millimetre rulers * Non-absorbent cottons * Laboratory scoop * 2 Test Tubes * 2 Pipettes * Medicine dropper Temperature: 10 and 25 degree Celsius Volume of water: 10 mL Peas: 10 30 KOH pellets 3-5 drops of food colouring Time: 3 minutes for equilibration and 10 minutes (5 times) for the long-term) Procedure: 1. KOH is strongly alkaline and caustic which might cause blindness. Skin contact was avoided and safety goggles were worn. 2. Pea seeds were placed in water for 24 hours before processing the lab. Some of the peas were kept dry and the wet seeds were kept in damp paper towels until they were germinated. They were checked daily to prevent the seeds from getting mouldy 3. The bath was filled with room temperature water to be prepared for the lab. On the other one, to make it 10 degree Celsius, ice cubes were put into the bath and the temperature was measured with the thermometer. 4. A wad of absorbent cotton was placed in the bottom of each of the vial and 30 KOH pellets were dropped into the cotton for the saturation. ...read more. Temperature (�C�1�C) Time (min) Differences in Control (Beads) ml�0.01ml Differences in Germinating Seeds ml�0.01ml Actual differences in Germinating Seeds ml�0.01ml Differences in Non-germinating Seeds ml�0.01ml Actual differences in Non-germinating Seeds ml�0.01ml 21 0 5 0.00 0.06 0.06 0.02 0.02 10 0.00 0.12 0.12 0.01 0.01 15 0.01 0.19 0.18 0.02 0.01 20 0.01 0.25 0.24 0.03 0.02 25 0.01 0.31 0.30 0.03 0.02 30 0.00 0.37 0.37 0.03 0.03 Processed Table 9: The volume of oxygen consumption in each 1.0 ml pipettes in room temperature water. The differences are calculated by subtracting final value from the initial value. The actual differences are calculated by subtracting the differences in control from the differences in germinating/non-germinating seeds. Temperature (�C�1�C) Time (min) Differences in Control (Beads) ml�0.01ml Differences in Germinating Seeds ml�0.01ml Actual differences in Germinating Seeds ml�0.01ml Differences in Non-germinating Seeds ml�0.01ml Actual differences in Non-germinating Seeds ml�0.01ml 21 0 5 0.00 0.06 0.06 0.04 0.04 10 0.00 0.09 0.09 0.05 0.05 15 0.00 0.14 0.14 0.07 0.07 20 0.00 0.17 0.17 0.08 0.08 25 0.00 0.22 0.22 0.10 0.10 30 0.00 0.26 0.26 0.11 0.11 Processed Table 10: The volume of oxygen consumption in each 1.0 ml pipettes in room temperature water. The differences are calculated by subtracting final value from the initial value. The actual differences are calculated by subtracting the differences in control from the differences in germinating/non-germinating seeds. Temperature (�C�1�C) Time (min) Differences in Control (Beads) ml�0.01ml Differences in Germinating Seeds ml�0.01ml Actual differences in Germinating Seeds ml�0.01ml Differences in Non-germinating Seeds ml�0.01ml Actual differences in Non-germinating Seeds ml�0.01ml 21 0 5 0.02 0.05 0.03 0.02 0.00 10 0.03 0.13 0.10 0.04 0.01 15 0.05 0.18 0.13 0.05 0.00 20 0.05 0.21 0.16 0.05 0.00 25 0.07 0.25 0.18 0.07 0.00 30 0.07 0.28 0.21 0.07 0.00 Processed Table 11: The volume of oxygen consumption in each 1.0 ml pipettes in room temperature water. ...read more. j) Why does the test tube have to be completely sealed around the stopper? The test tubes have to be completely sealed around the stopper especially when the volume of the air is decreased inside the test tube. This would lead to water suction into the pipette so that evident water change can be measured. By sealing around the stopper, the water will not go into the respirometer and prevent the oxygen from leaking out. The sealing of the test tubes segregate the internal and external pressure forces on fluids, letting water travel from high pressure (outside of the test tube) to low pressure (inside of the test tube). If the test tubes were not completely sealed around the stopper, the oxygen and the water will move in and out freely, preventing the measurement of oxygen consumption. k) Explain why water moves into the bent tube of the respirometer. The water moves into the bent tube of the respirometer because of the changes in pressure. The pressure that is inside the respiromter changed due to the removal of CO2. The internal part of the respiromter has lower pressure than the external part because the amount of gas inside the respirometer decreased due to removal of CO2. According to diffusion, the water moves from higher pressure to lower pressure. Since the pressure is higher outside of the test tube, the water moves into the pipette, where it has a lower pressure, and establishes equilibrium for constant pressure. l) Why does food colouring move in opposite directions? Explain why allowing the respirometer to stabilize before closing the pinch clamp would avoid this problem? In cold water, the food colouring moved toward the respirometer because the pressure in the vial was lower than the outside pressure. However, in warmer water, the food colouring moved away from the respirometer because the pressure inside the vial was higher than the pressure outside one. To avoid this problem, respirometer should stabilize so that the pressure inside and outside of the vial can stabilize. ...read more. Solution Mass of Chip (in g �0.01g) Length of Chip (in mm �0.05mm) -At start -At end -At start -At end 1. Distilled water 2.51 2.92 43.0 47.0 2. Let some DCPIP pour through the mouth into the 500cm3 beaker labelled "waste", leaving the DCPIP in the burette to the nearest whole cm3 and ensure that there are no air bubbles throughout the tube 7. Halve the lemon with a knife and squeeze out the juice from the halves into 500cm3 beaker labelled "lemon juice" 8. Similar to the previous error this too was reduced by conducting three trials. The volume of H�O, 20ml, was precisely controlled using a measuring cylinder and a difference in the volume will require different amounts of energy to heat 1�C. Keeping each volume the same enabled the energy content of the seed to be compared as the conditions were exactly the same. By preventing a change in temperature, we made certain that an increase/decrease in temperature would not speed up/slow down the rate of osmosis. Time The time span in which the cellulose bags were kept in the beakers were always at a constant time of around 24 hours.